Many would say these times are worse than ever before. We are suffering from more stress, illness, unhappiness, broken relationships and a sense of emptiness than any time in history. People are suffering with unresolved and painful trauma, abuse, neglect and PTSD. Without help we can feel a total lack control over ourselves and our lives. And the more we talk about how overwhelmed we are, the more overwhelmed we become. Our work-life relationships suffer, productivity decreases, and we dwell in a state of disconnected apathy, anxiety, anger and/or frustration. What if there were a way you could feel confident, purposeful and passionate about life? What would it be like if there was an easily accessible way to eliminate stress, limiting, negative and destructive beliefs and behaviors and truly heal the past? Imagine waking up every day feeling excited and passionate about your life. How would your life be different if your inner world became more supportive, encouraging and loving? What would it be like to not get angry, anxious or sad about past traumatic events that have held you back? How would you like to have a neutral feeling about those times and events? Hope can come in the form of learning how to use your mind to help you heal. Hypnosis, NLP, will help you heal, release and transform those limiting, negative and destructive thoughts, feelings and behaviors so you can thrive in a life of your design. 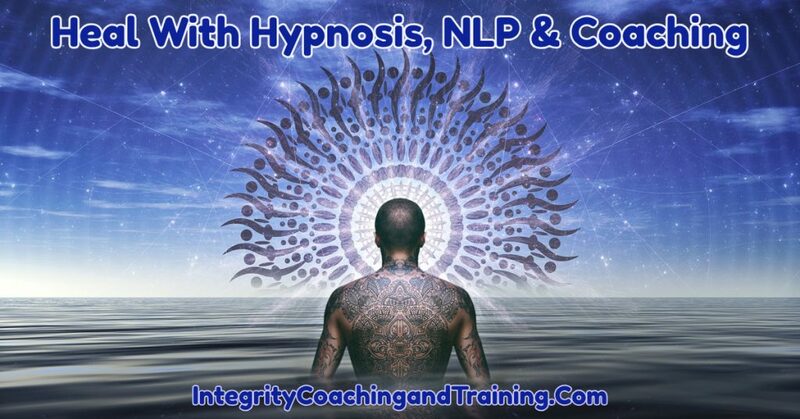 In our private sessions at Integrity Coaching & Training Systems we use hypnotherapy, NLP coaching, HypnoKinesthetics and other energy psychology methodologies to create powerful changes in the brain, mind and body. Multiple sessions will use the neuroplasticity of the brain to re-wire the neural pathways to heal, change, and eliminate old painful memories. Hypnotherapy will create new beliefs and values and create a compelling future. Did you know that future memories hold the same power as real memories of the past? It’s true, when done correctly, your powerful unconscious mind will go after that carefully created and successful future. Hypnotherapy can take you into the future to meet your future healthy self. In doing this your brain creates new pathways that produce new responses. And we will help you create these new future memories, so your brain can access them to create a life you can thrive in. We cannot change the past, but we have 100% control over how we experience past events. You can absolutely heal the past and create a bright new future. That’s our specialty here at Integrity Coaching & Training Systems. When our inner world supports us, our external life becomes empowering, rewarding and fulfilling. And isn’t it good to know you can choose to feel love, happiness, peace joy and other helpful and self-supportive states? You may want to schedule your healing sessions now, or add these helpful hypnosis audios to help you on your healing journey. Visit Our Store and purchase other helpful products. You can heal, change and overcome a life time of unhelpful experiences with hypnosis, neuro linguistic programming (NLP), coaching and other energy psychology modalities. Patricia, at Integrity Coaching & Training Systems can help. She will help you discover and embrace positive ways to “be, think, feel and behave” towards yourself. With these tools you will unravel and disassemble those limiting, negative and destructive self-beliefs. And you will transform them into the success you desire and deserve.